Debra Roberts joins Deidre and JG to discuss her simple and practical approach to making relationships and communication less complicated. We were thrilled to be joined by relationship expert Debra Roberts, LCSW this week! Debra is an experienced speaker, trainer, and clinical social worker, and she has developed what she calls the Relationship Protocol. This is a simple and practical template to having healthier relationships and making communication less complicated. 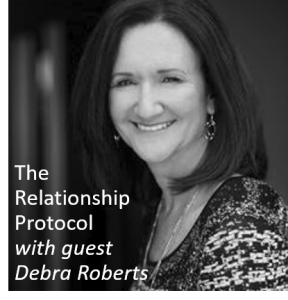 Debra’s recently published book (The Relationship Protocol) explains the protocol in depth and is an easy-to-read self-help guide for improving your relationships. Debra was kind enough to stop by our studio and discuss the book. Please listen to the episode for the fascinating details, including more on the WiZdoms below that Debra shared with us. "Tell me what you mean. What am I not listening to?" How do you have tough conversations? Conversations you don’t really want to have but need to? First, you want to pick a good time and environment (for example, don’t jump on someone the moment they get to the office in the morning, or at home don’t choose the time right before bed). When you start the conversation, state your intentions clearly up front. Here are three ways to get started. “I want to get along with you. I don’t want to fight with you. I want to be closer to you.” You can use any or all of these, depending on the situation. What do you do when you know you are right but the other person doesn’t agree? Winning has no place in a relationship. It’s not about being right. It’s a dialogue, not a monologue. Think of an umbrella over both of you and both of you are holding onto the handle. That umbrella is the relationship. You’re in it together. It can’t be about being right at the other person’s expense. Start the conversation using the tip above. What is a critical aspect of successful relationships? Kindness is critical. When we are kind, people feel safe. When people feel safe, there is trust. How do we show people that we value the relationship? Words and actions both convey this. What’s important is knowing HOW each person needs to be told or shown that you value them. There are no magic words or actions that work for everyone. LISTENERS: Do you have your own tips for keeping your relationships healthy? Share your experiences and “wiZdoms” with us! Either leave us a voicemail at 1-646-653-9278 or send us an email. We may talk about it - or we may even talk with YOU - on the air!